Parking was at a premium at the Gogo Burn when the Irvine duo arrived, but Allan demonstrated his driving skills, honed after many hours at the dodgems, in getting parked close, no, very close, to Paul. 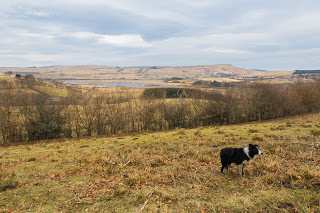 The weather was a bit dreich and, as we had another twenty-five minutes to wait for the bus to Seamill, it was decided to amend the walk and simply go to Fairlie and back. By the time the Pencil was reached the light rain was easing and, as it dried up, good progress was made towards the marina and on into Fairlie. The tide was in and we had to negotiate some scaffolding (erected to enable some building works) on the stone path, but soon we were passed it and stopped for coffee at the picnic tables on the Hunterston side of Fairlie. Since the weather was now distinctly pleasant, we continued on to the headland before coming back and within about half an hour we had returned to the same tables and benches for a leisurely lunch. By the time we started the return leg, the tide had gone far enough out for us to negotiate the scaffolding without any difficulty, and the walk back to the cars was uneventful. It had taken three hours and forty minutes for nine and a quarter miles, give or take. A good step out in what turned out to be excellent walking conditions. FRT was taken at the Paddle Steamer, aka Wetherspoon’s, where not only was it a tpd for some, it was a three plates of chips day. Footnote. On the way home there was no sign of the Police traffic camera encountered earlier. I’m sure you don’t need to worry Alan! Is the port now redundant? 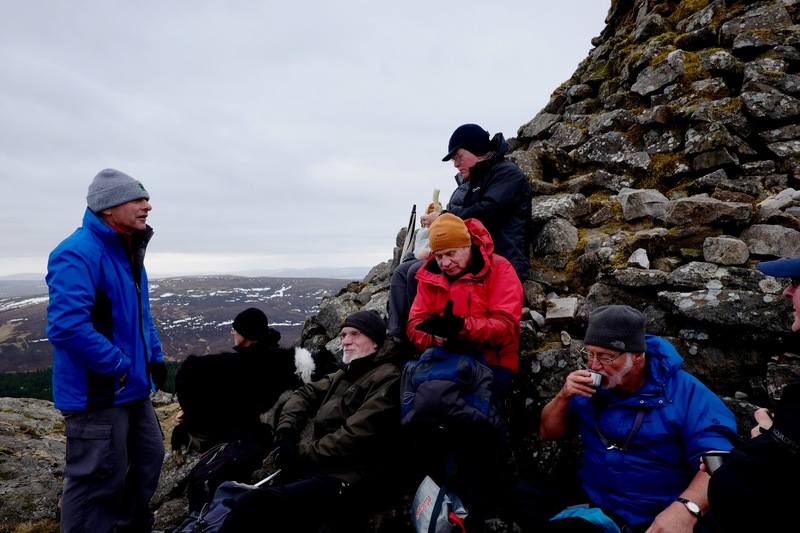 Ian, Malcolm, Paul, Rex, Dougie, Gus, Davie C, Alan, Kenny T, Davie M.
Eight people, one dog and three cars assembled at Glenbuck for the walk; with Rex and Dougie, delayed by traffic in Ayr, phoning to say they would head straight to our official starting point at Kames. Even our mathematicians were having problems with this logistical poser. We were considering phoning Robert in France to see if he had a solution when the aforementioned duo turned up at Glenbuck. Now it was simple - 10 people and a dog squeezed into two cars with two cars left behind. If the blog is to be believed, the Ooters last visit to Cairn Table was on 31 August 2016 and the record shows that on that occasion we all had the opportunity to admire Gus's plums. So this was a new walk for some and a long overdue repeat for others. The weather was dry, with a cool wind and the promise of rain later. From the start the pace was fast and once we started the climb proper we were soon well spread out on the hill. Ian and Gus, the drillies, raced off into the distance with the rest of us pechin' behind them. 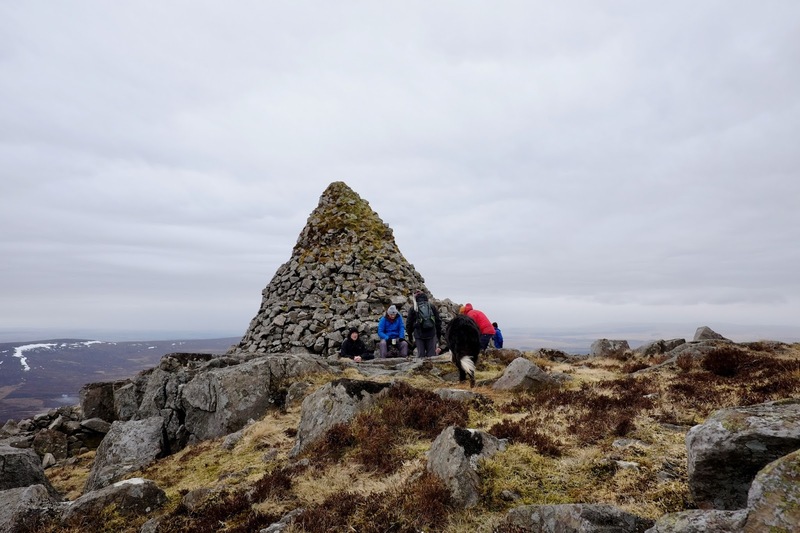 Fortunately, the previous Cairn Table blog had been written dictated by Davie M and he recorded a time of 1 hour 30 minutes to the top. This time he announced "1 hour 20 minutes", which was a fine achievement for a septuagenarian, but still 10 minutes slower than the time the young bucks had registered. 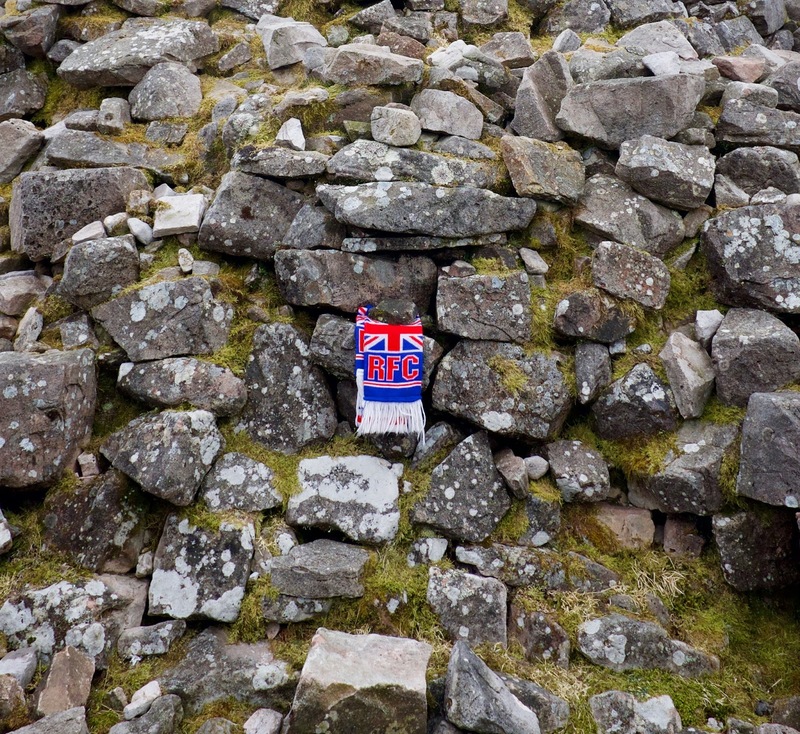 Attached to a post near the cairn, and fluttering in the wind in the style of a Tibetan prayer flag, was a brand new Rangers scarf. 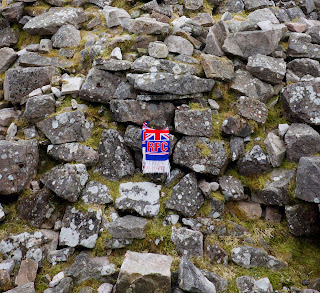 Whether it had been placed there to seek divine intervention, or whether it had been left there in disgust after the home gubbin' by Killie, we couldn't be sure but Malcolm took all the barbs with admirable restraint. We were sorry that Jim wasn't with us today, but Kenny took some photos for him. It was chilly on top so we were soon up and going again - or at least the last to arrive were. Ten Ooters managed to find half a dozen different ways off the hill but we all gathered beyond the ramshackle footbridge over the Douglas Water (that's its name according to the map) where the shooters' track ends. The rain we had been expecting had now arrived and full waterproofs were donned, though the rain was never particularly heavy. We continued beyond our usual lunch spot, finding shelter on low banking at the side of the track. Then we completed our descent to Parish Holm, where the verges of the track to the A70 were carpeted in snowdrops. After skirting Glenbuck Loch we were back at our cars, completing the walk 10 minutes faster than in 2016. Again we all piled into the two cars, though Holly was a bit reluctant to sit on Alan's knee. FRT was taken at the Empire Bar. We were sorry not to be asked "Does your dog bite?" since the regular at the bar has been in hospital for several weeks. We wish him well. On the week of the Cheltenham Festival, a field of fourteen geldings paraded in the paddock at the football ground car park for the Ness Glen Novices Stakes. Runners and riders (see Gus for the name of Winona’s sister) were well versed on the track as we would be repeating the route as detailed on the 27 December 2017, so we set off at a trot, in dry overhead conditions, on ground which was to be, officially, good to soft. 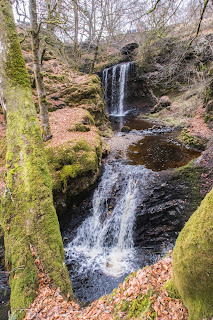 The Promised Land was soon passed and the road up to Dalcairney Linn was taken at a canter. As is our norm now, we decided to have coffee at the benches at Barbeth, with this viewpoint arrived at after an hour. The track down to the Craigengillan road was mercifully quite dry but there was a chill wind on the exposed sections. Good views were had of Fort Carrick and the Dark Sky Observatory as we approached the stables, but the rain started to fall, a disappointment since the forecast had indicated no rain until around 2pm. Nevertheless, the start of the gorge was reached at noon and, after another twenty-five minutes, we were at the dam. Lunch was taken in the shelter of the dam as the rain was unrelenting, not pelting but just steady, and we had to assume that Loch Doon was still there, as we set off on the return journey without going up to see it. A first for the Ooters doing this walk? The high road was chosen for the chase down to the footbridge over the Doon, now resplendent with a new deck, and, with the conditions now miserable, the final gallop back to the cars was made in forty-five minutes. Use of the whip for the final straight had been banned, and it appeared that Holly, the only filly in the race, had won by a nose. Dougie, who was odds-on to fall at the first fence, managed to make it round unscathed, whilst Paul managed to avoid the water jump! The whole walk had taken three and three-quarter hours, matching the quickest time previously recorded by your scribe in September 2016. It was difficult to get a good rub down as the rain was quite heavy by the time the paddock was reached and, since our grooms seemed to have disappeared, getting changed was the hardest bit of the day, being wet from the outside in, and the inside out. FRT was taken at the Dalmellington Inn where the locals, well in control of the remote, were watching the aforesaid races at Cheltenham. Special mention goes to Alan, whose gallusness procured Kit-Kats for those taking coffee. The legs had been well stretched, the only real hurdles had been the wet conditions, and the time in the pub was well earned. Footnote. When the Irvine guys got home, the streets were bone dry. Meet Glenbuck car park 10.00a.m. Leave some cars here and adjourn to Kaimes. Walk over Cairntable and back to Glenbuck. It was about 9.40am when we set off from the Annbank Bowling Club to do the ‘Annbank Circular’ in the clockwise direction. The weather was dull, but dry, as we made our way down Weston Avenue before turning left at Mill Road and heading for the river. Underfoot conditions were reasonably good, with only a few stretches of muddy stuff to deal with, and hence good progress was made until a coffee stop was called for at the fishermen’s shelter opposite where the Water of Coyle meets the River Ayr. A couple of tricky riverside sections had to be negotiated (as the result of wee landslips) but with the help of his minders (carers, more like) wee Davie emerged stirred and only a bit shaken. 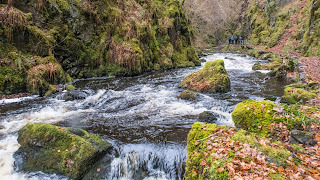 We crossed the river at the road bridge on the B744, and then continued on the path past the viewpoint at Wallace’s Seat and on towards our usual lunch spot at the Burns and Wallace Monument, dealing relatively easily with the mucky wee inclines that have taxed us previously. 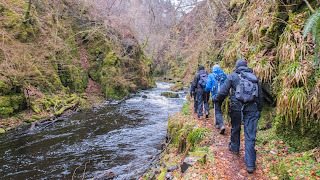 It had taken two hours to get there but, as we enjoyed our sandwiches, light rain began to fall so we didn’t delay too long before crossing the road bridge and heading back to Annbank. The return journey is much shorter given that the big loop in the river is missed out, and we were back at the cars in about forty minutes. The rain had accompanied us all the way back, but it was not an issue and had gone off as we changed for the journey home. ﻿Seven miles in three hours, with two stops. Not bad! No FRT today as we were going to have another attempt at a curry night in honour of ‘handsome’ Davie’s landmark birthday. Ever wondered how they make Irn-Bru? Kenny R couldn’t join us for the meal, but Ronnie was welcomed back into the fold. The food at the Jewel in the Crown was excellent and a good time was had by all. As usual, the diehards retired to Wetherspoon’s for a wee nightcap. Here we have a couple of pictures of the rabble. Anyone interested meet in the bar of the Portman Arms in Irvine Road about 7.00 p.m. The game kicks off at 7.45 p.m. Pay at the gate £15 perhaps ? Tickets from the Killie shop at the ground or Nelson Street , £15 for pensioners. Meet at 10.00a.m.in the car park on the entrance to Dalmellington from Ayr. 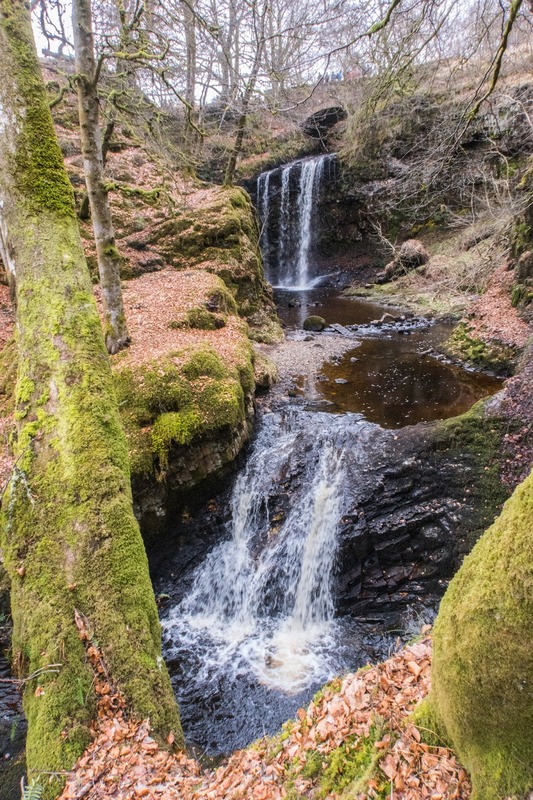 The walk is the Ness Glen in a counterclockwise direction weather permitting. There was an encouragingly good turnout given the ‘Baltic’ weather conditions and, as we assembled at the bowling green, many layers were donned. Overhead was bright and sunny with fresh snow providing good grip underfoot as we set off along the Grougar Path towards Loudoun Kirk. We were able to leave the road and follow the river on this occasion, an option that is usually determined by how muddy it might be, and good progress was made despite being against the snell wind. The Kirk was reached after an hour and a half, just in time to see a hare being chased across the kirkyard by a big dug whose owner was not too bothered. Holly, also, was not too bothered, thinking possibly about what scraps she might get from our coffee break. 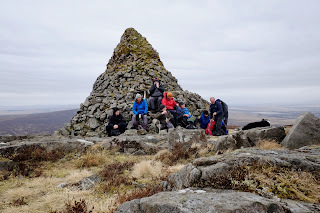 Rather than taking the road option up to Loudoun Academy, we turned right on leaving the ruin and took the path towards the outskirts of Galston, before crossing the main road and heading up past Grant’s factory to the cycle track (Chris Hoy Way). This track took us back to Hurlford with the wind on our back, although we did stop, briefly, at the viaduct for lunch. We were back at the cars after three hours and thirty-five minutes having covered just over nine miles, almost the same as last week. 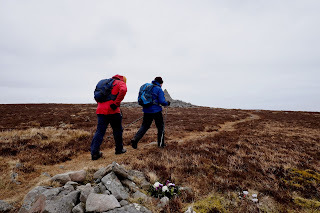 We had been lucky with the weather having encountered dry, bright overhead conditions and, with large parts of the walk being sheltered, the breeze/wind was not an issue. Neither was the snow an issue, ranging from little to six inches. A good walk, considering! We did not partake of FRT as we were looking forward to our curry night in honour of Derval Davie’s 70th. When we arrived at the Jewel in the Crown in the evening we were greeted with a sign, saying ‘Closed due to severe weather’. Disappointment all round but understandable, probably. Having adjourned to Wetherspoon’s we had a meal there, after a good few attempts to place the order. “Sorry, only four big steaks left. Sorry, no mixed grills left.” Nonetheless we enjoyed what we had, and what we had was washed down with an ale or two! Well done to everyone for getting there in such bitter conditions and making the night a success! Meet at the Annbank bowling club at 9.30a.m. The proposed walk is the Annbank circle which may be muddy,expect glaur. The Jewel in the Crown will be booked at 7.00 p.m. for the curry we missed as a result of the Baltic weather on the 28th. Please let me know if you cannot attend. I will book for 16,i.e. The 12 who were present on the 28th plus Rex,Alan Stewart ,Jim Dinnit and Kenny Thompson.